Featuring: Vincent Price. Director: Kurt Neumann. Once it was human -- even as you and I! The Fly! I just saw that when I was looking at the cover. You just don't get phrases like that on the posters for the sci-fi movies of today. They're all sophisticated and s***. The way this movie looks, feels, and plays isn't at all sophisticated - but the story is. 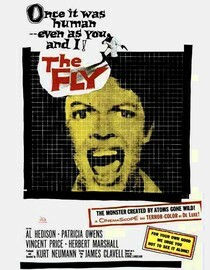 The Fly was a magnificent sci-fi tale for it's time. Showing that gross puppets or CGI aren't necessary to spin a good yarn. And, this is a good story, hell it's the second version of the movie I've reviewed in as many weeks (click here to read the review for the 1986 version of The Fly) so it must be a good story. I will admit though, I enjoyed the Jeff Goldblum version a little more, it was just scarier. This movie is also special because it marks the final day of our week long Vincent Price marathon. Although he is only a co-star in this movie he again knocks his role out of the park. Damn I love that guy (no homo). Definitely check this flick out because it'll be a while yet before we get any more Vincent Price around here. Why is it in your queue? Classic sci-fi tale, Vincent Price, awesome tag-line! Is it artsy? No, although it does have some deeper undertones. Best thing about the movie? The fly mask. What mood should I be in to watch this movie? In a mood for a classic treat.